The moment calendar days can be seen on next month’s page, I impatiently fast forward to that page. I’m inking in all the things I’ve planned for April. 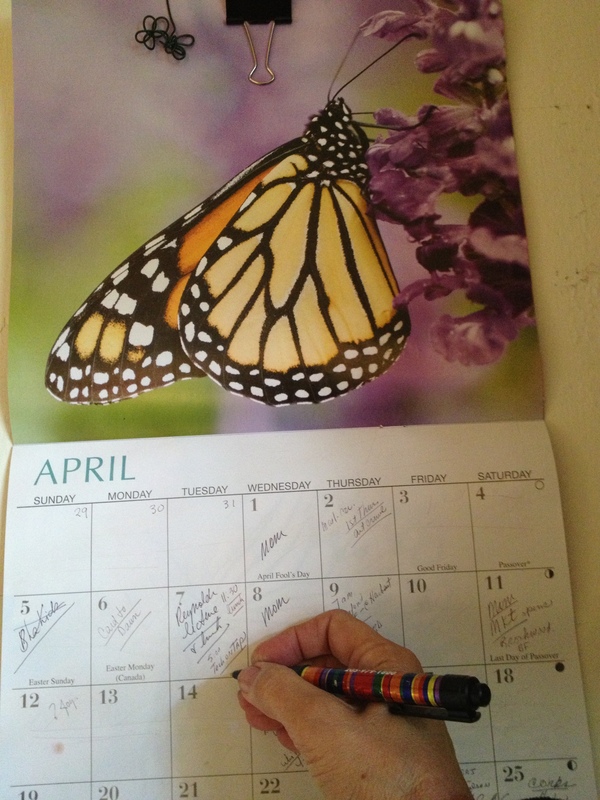 Yes, I have an online calendar – but I still put everything on my kitchen calendar. It’s on the small sliver of wall space next to the counter that holds the coffee pot. I like seeing my month at a glance as, I pour my first cup of dark brew. Mom says my coffee is more espresso-esque. Bacon is in the oven, as I’m too lazy to nurse it on the stovetop. Jazzmine is purring loudly in the chair across from me as the aroma fills the kitchen. She’s hoping for a taste or two. I’m sipping my third cup of coffee, just poured my first glass of champagne and watc hing CBS Sunday Morning on the tiny TV in the corner of the kitchen.